My 3.5 year old has always been a very easy and well-behaved child. (Yay!) But lately, he seems to have started acting more like a toddler. This changes things! So, I’ve been reading up and reviewing parenting books for some ideas. Our biggest challenge these days is trying to get him to do what I say. I don’t want to get stuck yelling and threatening to take toys away all the time, so I needed some new ideas. I actually found this book in the tiny book section at the grocery store! I’d never heard of it, but I flipped through it and it looked pretty helpful, so I bought it. I really think this is a good reference book! I didn’t read it all the way through. Instead, I just read the chapters that applied to our situation and I’ve gone back to it to read more or review depending on what comes up. It’s very easy to follow, and each chapter is pretty short and simple. If you aren’t a big reader or you don’t want to read a bunch of technical details, this is the book for you. Most of the chapters are under five pages and they are designed to be user-friendly. The main points are highlighted with larger print, examples are in green print and special anecdotes are in their own little boxes. This book has 379 pages including the index, but it is an easy read if you do want to read it through. If you don’t, you can pick the chapters that work for you, (like I did.) There are a wide variety of topics including: bad words, biting, chores, new baby, lying, mealtime, potty training and more. All of the big things you need to know about are covered! The parenting approach is assertive and respectful. They promote discipline and communication over punishment. The authors don’t go into great detail about child-development, but they do give you some information about why your child thinks and does what they do so you can understand your child’s point of view better. Overall, I’m finding this book very helpful. I wouldn’t rely on it as my only parenting book, (and my favorite is still The Happiest Toddler on the Block,) but I have this book next to my bed and have been browsing through it every night. It’s a good resource for quick tips. This isn’t on the same topic as my usual posts, but it could make your life better if you are a cat lover…. 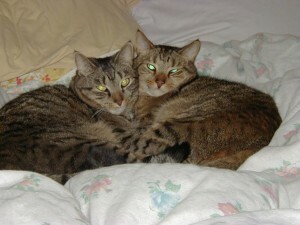 I have two cats and I’ve tried so many kitty litters over the years. None of them really hide the scent like they promise. I hate the cheap ones that throw yucky dust in the air, I hate the ones that the cats track around the house, I hate the ones that don’t really clump. It’s hard to find a kitty litter that really does what it promises to do without costing more than I want to pay. A couple months ago, I had a pretty good coupon for Arm & Hammer Clump & Seal kitty litter and it wasn’t too expensive, so I gave it a try. From the first day I used it, I noticed a big difference. This product promises to seal the odors into the litter and it really does it! I saw my cat get in the box and I braced myself for the stink, but almost as soon as the cat covered his mess, the smell was gone. I was surprised, but after a couple weeks, I was convinced that this stuff really does what it promises to do. Last time I shopped, I had a coupon for a different kitty litter, so I bought it instead. Again, I can tell a difference. As soon as we are through this box, I am going back to the Clump & Seal. It does everything I want my cat’s litter to do. It clumps and hides the smell, it doesn’t track all over the house and it doesn’t throw dusty in my face when I pour it. I’m really pleased with this product! Posted in Cleaning, Products That Really Work! 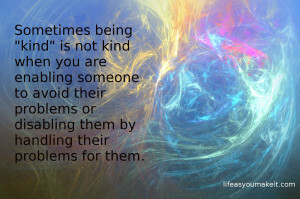 Sometimes being “kind” is not kind when you are enabling someone to avoid their problems or disabling them by handling their problems for them. I did this last year and am excited to see it’s an option this year again! I use Turbo Tax every year anyway because it’s much easier and faster for me, plus it catches a lot of credits I wouldn’t know to look for. Last year, they had an offer that gave you an extra 10% when you directed part of your refund directly to an Amazon gift card. Since I buy a lot on Amazon, from books to diapers to wipes, to household cleaning items, some groceries and more, I sent $500 of my tax refund directly to my Amazon account balance and got an extra $50 added on for doing that. Since I would have spent the money on Amazon eventually, I appreciated that I got an extra $50 to do it all at once. That balance last at least six months as my monthly Subscribe and Save orders came directly out of it. I think this is a great deal! I have blogged about the benefits of Amazon in the past. I really save a lot of time and money with Subscribe and Save and this 10% bonus will come in handy. Here’s my previous blog about it. 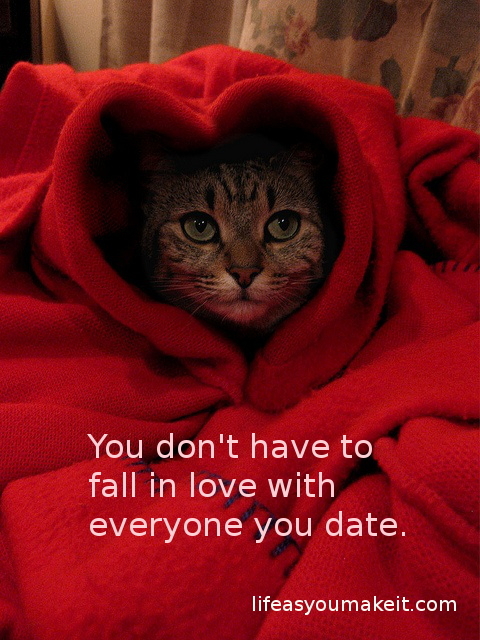 You don’t have to fall in love with everyone you date…. 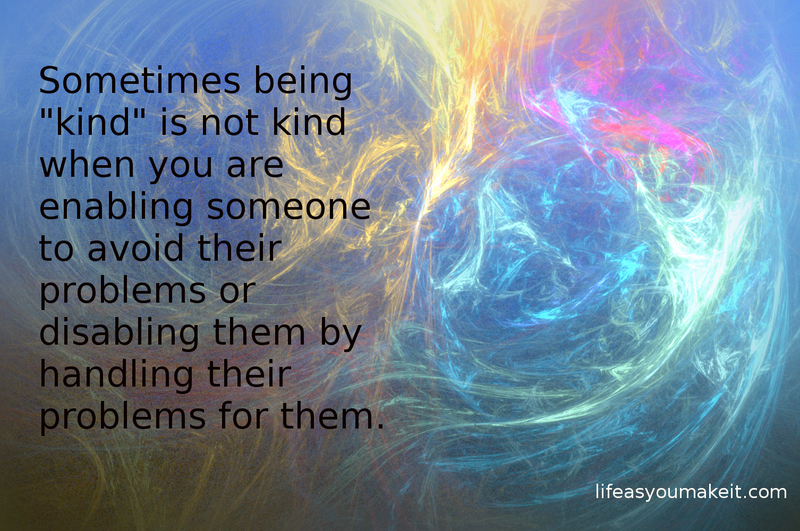 Perhaps this seems like common sense to some people, but some of us have trouble with it. Sometimes we feel like if initially like someone, we have to keep making it work. Or we feel if we’ve invested some time, we should keep trying. Or, some of us might be so desperate for a date, that we’ll take anything that comes along–even if it’s not what we really want! It can be tempting to hang on to a dead-end relationship, or even keep trying to create a relationship when it’s obviously not happening, just because being single isn’t always so great. Or you remember the early spark and keep trying to recreate it when it’s clear the situation is hopeless. I once read an article about the ways men and women approach relationships. It said that women are more likely to keep trying once they’ve invested some time while men are more likely to cut their losses and get out once it’s clear that things aren’t really going to work out. We all need to be brave enough to do that! Some people might be perfectly nice and still not be the one for us. It might be hard to break up with them for that reason. But the reality is: you don’t have to fall in love with everyone you date. Don’t be afraid to let go of the wrong relationships or potential relationships, and don’t feel obliged to continue them. They just distract you from where you really need to be. I’ve always had a good impression of Mister Rogers, and I know he was well-regarded for his ability to understand and work with children, so when I saw this book at a book sale, I purchased it. I’m glad I did! This is a helpful and easy-to-use book. Each chapter focuses on a single topic and is only about four to six pages long. So, you can read the book all the way through, or you can read just the chapters you need. The most important parts are highlighted with larger print, and short examples are set aside in light blue boxes, so the information is broken up and easily accessible. And it’s good information too! The approaches Mister Rogers offers are gentle, but assertive. They are about guiding your child rather than dominating him or her. Mealtime, Everyday Rules and Limits, Brothers and Sisters, Using the Toilet, The New Baby and Stepfamilies. Some of the ideas I find the most helpful include: “Choose a few rules that matter most.” The idea is that it’s easier for a child to obey when they aren’t overwhelmed with rules. “When possible, offer choices.” This hint works because toddlers in particular want to feel like they have some independence in their lives so they don’t struggle against their parents’ choices. “Make sure your children have some time away from each other.” This helps children avoid resenting each other. There are many other practical ideas as well, but they all help you guide and discipline your child in a caring manner that helps your child learn to be thoughtful, caring and disciplined as well. 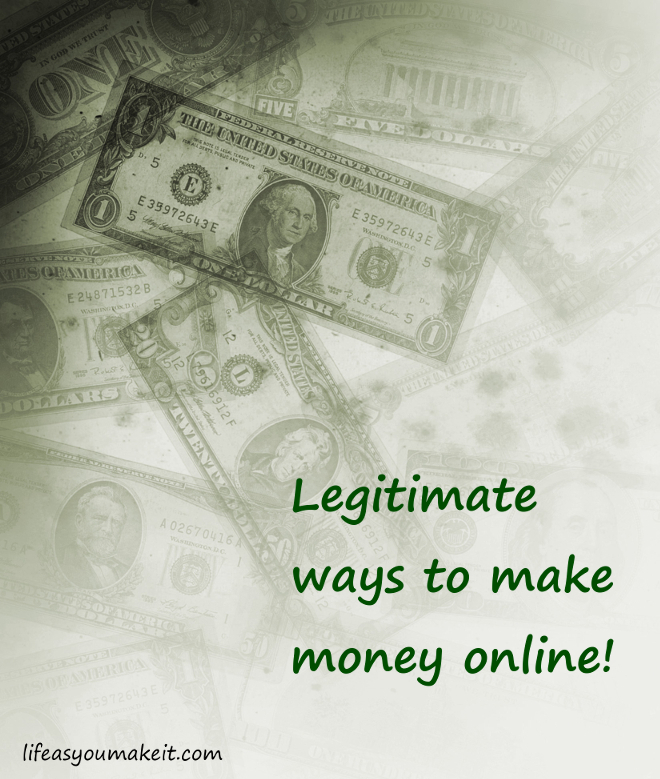 I’ve posted before about my experiences with using survey sites to make money. So far, my favorite is Inbox Dollars, (I’ve cashed out over $120 and have another $24 accumulated now!) I don’t follow very many survey sites because it’s hard to make enough money to cash out unless I’m more focused, so I stick with that one the most. I also use Pinecone Research, but they don’t open for new members often, so you have to wait for that one. I’ve made $36 on that site. There aren’t a ton of surveys, but the ones you do get are well worth it and you can ask for a check any time. Inbox Dollars sends a check and Pinecone Research has multiple options, including a check; however, this latest site offers gift cards. I’m a huge Amazon fan, and I use the site to buy books a necessities, (like diapers for my kids using Amazon Mom,) so this works well for me. My newest one that I’ve found to be a good deal is MintVine. I haven’t done a whole lot on that site yet, but I’ve already earned a $10 gift card, (I used it for Amazon,) and I’m half way to the next one. I found that the points to cash out added up pretty quickly. I think it took maybe two weeks? 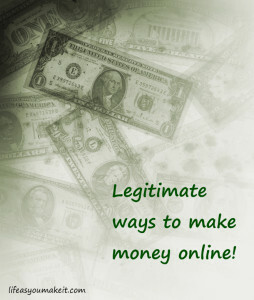 You won’t get rich, but to click on a few surveys, it’s a pretty fair deal. There are incentives for referring people, for taking short surveys, for completing your profile and more. Plus, every time you are rejected for a survey, you get 5 points, (which equals 5 cents.) If nothing else, you could make 15 cents a day just to click on the daily poll and be rejected for a couple surveys. Here is a referral link if you want to join MintVine. I think it’s definitely one of the better sites. 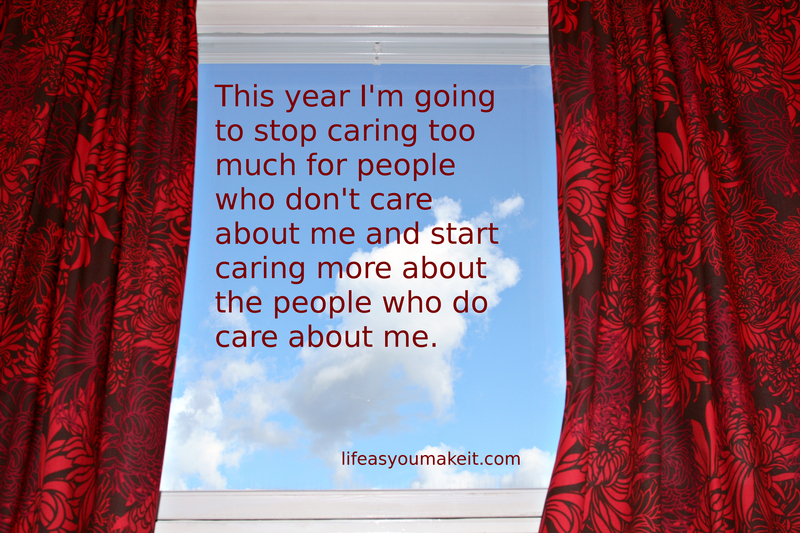 This year I’m going to stop caring too much for people who don’t care about me and start caring more about the people who do care about me. I think we’ve all done it. 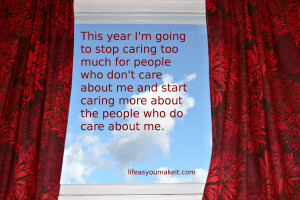 We’ve all learned to care more about or like another person more than they like us back. Not that there’s anything wrong with caring about or liking people, but sometimes we spend so much time being there for others who can’t reciprocate, that we neglect the people who do care about us. I’m a codependent type. If I see someone who doesn’t have much family, who seems to be bullied, who seems sad, who seems to be struggling, sometimes I will become very invested in helping that person. I will spend time thinking about them and ways to help then…while they are out having fun with their friends and ignoring me! On the other hand, I have friends who spend time caring about me and I don’t always reciprocate well because I’m caught up with someone else who doesn’t really care a whole lot about me. This year I would like to change that and show more appreciation for the people who care about me while spending less of my precious time pursuing those who can’t or don’t want to. I think life will be better for me, and would be better for everyone if we prioritized our relationships to focus on those who want to be in our lives and let the people who don’t want to be in our lives us go their own way to spend time with the people who are better suited for them. No more trying to chase friendships or relationships with people who aren’t as dedicated!